Geology Drift over Namurian sandstones. 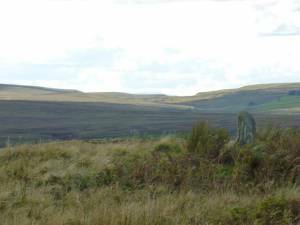 Record Name Boundary Stone (possibly reused prehistoric standing stone) at meeting of three moorland parishes. Record Description This small standing stone is located on the summit of Stony Hill close to, but some 40m west of the point where the drystone boundary walls defining the limits of Arkengarthdale,Bowes and Scargill Civil Parishes meet. 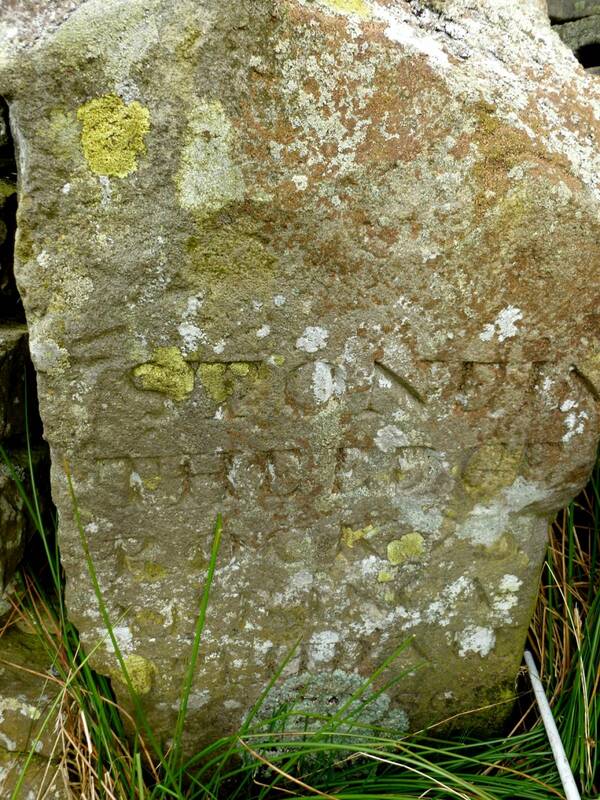 This stone has a large capital B painted on it and is clearly representing Bowes Moor. All other boundary stones on these boundaries have formal carved lettering,see photo images. This standing stone is heavily weathered and seems to be of greater antiquity than the 19C walls. The idea that this stone could be prehistoric may be fanciful, however let us speculate! The standing stone marks the place where the summits of Blencathra together with Bowscale Fell and (only on a very a clear day), Carrock Fell, first become visible some 70km to the WNW through the Stainmore Gap. Stainmore is the easiest and most direct crossing of the Pennines and for the traveller on foot the route of the Badger Way following the southern edge of Teesdale is the natural routeway. The Badger Way traverses Gayles Moor, Barningham Moor and Scargill Moor all marked by clusters of cup and ring stones and other prehistoric stes, to reach the glaciated plain of Stainmore and from thence to the Vale of Eden with the Neolithic Monuments near Penrith and further North and West to Galloway and to Ireland. Carrock Fell, visible to the keenest eye from the Stone is a most impressive igneous rocky summit overlooking the Vale of Eden at the northern edge of the Lake District Fells. Carrock Fell has an interrupted stone dump summit enclosure which is likely to be Neolithic in origin and a large stone round cairn which is more certainly late Neolithic. Swaledale itself and Wensleydale are cul de sacs and not natural routeways. Image 1 Description Standing stone at Stony Hill view through the Stainmore Gap to Blencathra (Saddleback) and Carrock Fell. Image 2 Description Boundary stone with formal lettering: 'Stone in the edge Arkengarthdale'.